Let's hear it for Alfred Lion and Francis Wolff. They're two Jewish guys, old friends, who fled from Nazi Berlin in the Thirties and started a little company in New York called Blue Note Records. I have loved jazz since I was a kid. So did Al and Frank. Only I just bought records. They made them, setting up a studio that became the most distinguished label in jazz. This is their story, and essential jazz history, old and new. A "blue note" is a shift in interval, coming up with a note whose sound's not quite what's expected, especially in jazz. And first and foremost, Blue Note Records put out jazz albums, the best. They gave jazz music - jazz artists - a place to grow and breathe; be itself; themselves. Blue Note was the rarest of things, a wedding of business and art that favored the art. They took chances, and trusted in their artists, put creativity and freedom first and let the musicians stretch out. They didn't know anything about making records. They didn't know much about jazz. They just loved it. So they made records and sold them. They took their lumps, not dictating the terms or content of recording sessions or records and willing to survive if a record didn't sell well. (Eventually some did sell, very well indeed.) It's hard to imagine what the rank and file of us would have, we who love jazz, from the late Forties up till the Eighties, were it not for Fred and Frank and the artistic freedom the provided to some of the greatest geniuses of jazz, to grow and experiment and set down their best ideas. This documentary by Sophie Huber is for and about Fred and Frank. And Frank in particular, snapping photos and husbanding the album-making, is omnipresent in the background of the story for the first three quarters of the story. But what makes this one of the best documentaries about jazz in a while, though, are those in the foreground, both in the dozens of black jazz artists who made the recordings that are a serous part of the legacy of John Coltrane, Thelonoius Monk, Bud Powell, Art Blakey, Clifford Brown, Miles Davis, Joe Henderson, Jackie McLean, Herbie Hancock, Wayne Shorter - this lists goes on, and it's dazzling - and in present-day interviews and recording sessions. Blue Note began by recording boogie woogie piano masters Meade Lux Lewis and Albert Ammons. But they soon moved on to newer stuff. The creativity and personalities of the most advanced jazz artists, and the successive styles of bebop, hard bop, cool jazz, avant garde and free jazz (shortchanged in this film) and more mainstream stuff, are such a rich story that frankly it swamps the history of the label itself at times, and we don't really get to know the men who first ran it very well. But it hardly matters. I would throw the rest away just to hear Herbie Hancock tell the story about what he learned from Monk about open-mindedness when he made a horrible mistake and Monk saved it in a recording session. There are magic moments here, and they're from the present as well as the past. The film samples the recordings, narrating the record company's history. It shows archival films of the artists and - key to the beauty of the film and the style of the label - the LP album covers, using still photos by Frank Wolff and graphic art by Reid Miles with those distinctive color tints, the unique period "look" of the classic Fifties and Sixties Blue Note album covers essential to the label's image. There is nothing more iconic in the world of records. This film does not betray or cheapen this look but allows it to permeate the screen. Few historical films come supplied with a more distinctive and handsome set of images. Let's hear it also for producer and music historian Michael Cuscuna, the successor and heir to Francis Wolff and manager of his photographic and recording legacy. He is much heard from here. And let's hear it also for the legendary recording engineer Rudy Van Gelder, technical supervisor of thousands of recordings, specializing in jazz. He passed two years ago next month, but we hear from him here in a recent interview where he talks about how he started a studio for Blue Note in his parents' living room in New Jersey, then eventually built a cavernous, temple-like independent studio, still in New Jersey. Besides the voices of Shorter and Hancock, Lou Donaldson is an oldtimer, present nearly at the conception of Blue Note bop recordings but a musician of great longevity, who is frequently heard from as a lively independent talking head. We also hear from time to time throughout from Don Was, current president of Blue Note Records - which has died and been reborn several times since the departure of Alfred Lion and Francis Wolff. And we hear from hip hop musician and producer Terrance Martin, a current force in the new Blue Note Records, who shows how much jazz, and Blue Note jazz in particular, is a part of hip hop music. I didn't know this, and have a little trouble believing it. But assuming Terrance Martin is right, it's another proof of the eternal youth of this amazing label. And the longevity of - some - jazz greats as well as the energy of today's jazz are shown when Hancock, a youthful seventy-something, and Wayne Shorter, a youthful eighty-something, join young Blue Note leader Robert Glasper and his group for a present-day recording session. It is a little astonishing to see the succession of great Fifties and Sixties Blue Note artists as they appear in brief films of them recording at the time, many of them whose looks were unknown to me. So many of them look nondescript. That's part of the story too. This is just creativity, not showmanship. The elegant matching suits of the Modern Jazz Quartet, Miles' flash and provocation, are for for show. But there is a part of jazz, which Blue Note quintessentially expresses, that lets us in on the creation, into the studio, the workshop, the very minds of the musicians doing their best and most original work. There is a 1997 film shown on TV, Blue Note - A Story of Modern Jazz, which I have not seen. Information about it is provided in Joe Bendel's review of Huber's film from Tribeca, which gives more names and facts. What gave Blue Note the edge over the also good jazz label Prestige Records, we learn, is simply this: Blue Note paid the musicians to rehearse. Hence they could develop new and more challenging work. 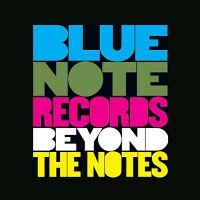 Blue Note Records: Beyond the Notes, 86 mins., debuted at Tribeca Apr. 2018, also showed at the Sheffield doc fest. It was screened for this review as part of the San Francisco Jewish Film Festival, where it shows at the Castro Theater in San Francisco at 3:15 p.m. Sat. 21 July 2018 and at the Paramount in Oakland at 4:01 p.m. on Sun. 5 Aug.